Address: 0 Budapest, Károlyi Mihály u. 11-15. The hotel has 123 rooms. 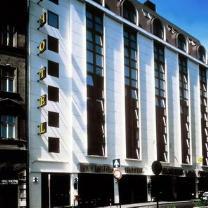 Modern 3-star upscale hotel situated in the heart of Budapest, in the primary business and financial district within a few-minute stroll from the famous shopping street Váci utca. Services: 123 air-conditioned rooms, meeting facilities (10-100 persons), restaurant, drink bar. Erzsebet Hotel has the same age as the Hungarian capital. Budapest dates back to 1872 when three towns, Buda, Pest and Obuda were united. That year the hotel, called Queen Elizabeth (Erzsebet), named after the wife of the then ruling monarch was inaugurated. Today the building preserves from the more than 100-year-old past, of course, the excellent traditions only. The age worn house was closed in 1976, and later on it was even pulled down, and the modern three-star Hotel Erasable was opened in the summer of 1985. The house can be found in the center of the capital, quite near the business quarter and places of entertainment. The railway station is situated 2 km from it, and it takes 30 minutes to get to the airport by taxi. It's easy for the guests to reach everything in a short time, and they need not be afraid of the nuisance caused by the heavy traffic, because all rooms are specially soundproof. All the guest rooms, all the public rooms, the restaurant, the drink bar, the two banquet rooms are air-conditioned.